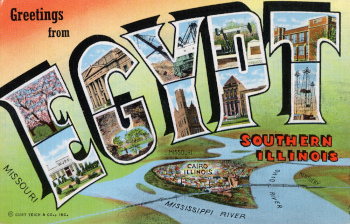 Most of the stories and accounts offered here are associated with the southern section of Illinois popularly termed “Egypt.” Therefore, it may be meaningful to explain why this region is frequently referred to by that name. The boundaries of “Egypt” in Illinois are agreed upon to be the Wabash, Ohio, and Mississippi rivers on the east, south, and west. The northern limits, however, are indefinite. There are some, with reasonable territorial ambitions, who would have it include all the state lying south of an east-west line in the approximate latitude of Vandalia. Others, perhaps less imperialistic or perhaps selfish, would include only that part of the state lying south of the Baltimore and Ohio Railroad, roughly a line from East St. Louis to Vincennes. A second term, Little Egypt, often is applied to a smaller area at the southern tip of the state. It includes eleven southern counties, ending on the north at about the latitude of the city of Benton, in Franklin County. Neither of the above terms is recognized as an established geographical place name, and until comparatively recent years they were little used outside the area. For a long time, they were convenient colloquial terms. But, of late, the names have gained wider recognition because they are handy headline designations for southern Illinois in the metropolitan press. The use of these terms, Egypt or Little Egypt, to indicate a region so far removed from the valley of the Nile naturally arouses the curiosity of outsiders. Several explanations for the use of the names have been advanced. The two cited most frequently deserve comment. The first explanation states that the region was so named because places bearing the Egyptian names of Cairo, Goshen, Karnak, and Thebes were located in it. The name of Goshen, or Land of Goshen, first was applied to a settlement in the south part of present Edwardsville about 1800. The name of Cairo now applied to the town located at the confluence of the Ohio and the Mississippi, first indicated a bank, the Bank of Cairo, chartered in 1818. This bank, which did not survive long, was located and had its offices in vanished Kaskaskia about one hundred miles northward. The present town of Cairo was planned and a charter was secured by the name Cairo City and Canal Company in 1837, at least five years after the name Egypt was in common use. Unless the name Egypt came from “Goshen,” “Land of Goshen,” or “Goshen Road,” all in use in the first decade of the 1800’s, it is difficult to support this place-name theory. The following is a second explanation of the way in which the term came to be applied to the region. This one is supported by documentary sources and by numerous traditional accounts. Perhaps the best explanation of the origin of the term is the one given by Judge A.D. Duff, a prominent attorney, circuit judge, and the person designated as Professor of Law on Southern Illinois Normal University’s first faculty. Judge Duff’s account appeared in the Golconda Herald in the 1860’s, having been copied from an earlier issue of the Shawneetown Gazette. According to his story, the conditions leading to the use of the term Egypt in relation to southern Illinois began with the winter of 1830-31. This was the “winter of the deep snow,” the longest and most severe winter that the residents of Illinois had known. Snows came early, reached a depth of three feet or more, and remained until late spring of 1831 and severe frosts continued until May. According to Judge Duff, it was a “very backward spring.” The summer was extremely cool and killing frosts came on September 10, making the growing season a short one. The late spring naturally delayed the planting of crops. The September frost killed much of the unripened corn in the northern counties. Only in those areas lying south of an east-west line approximately through the locality of Benton in Franklin County did corn properly mature. Farmers north of that line were forced to seek corn for their livestock, for the universally used corn meal, and for planting in counties farther south. When this was happening, Judge Duff was a well-grown lad living beside a much traveled north-south roadway in Bond County. He saw many wagos going south to find corn and returning with the treasured grain. Some of these stopped overnight at the Duff home. Many of the farmers driving those wagons were Bible readers who remarked that they, like the sons of Jacob, were “going down to Egypt for corn.” The designation of the southern counties of Illinois as Egypt thus came into use. No record of the term has been found previous to 1832. Once applied, however, it rapidly came into general use. The journal of Daniel H. Brush, prominent citizen of Jackson County, covering the 1830’s, refers to Egypt and indicates the same origin for the nickname. At times the name of Egypt or Little Egypt has been used in a somewhat derogatory way, though originally the name carried no stigma. In fact, it was worn with considerable pride.